Princeton Engineering Services, PC provides innovative solutions for the design of high performance buildings. Design facilitation to provide innovative solutions to all aspects of building design. Energy simulation to assess building performance and show compliance with ASHRAE 90.1. LEED green building assessment and certification. PES can lead the design team through the LEED process and provide insight on how other green projects meet the requirements of each credit. PES can perform and certify a LEED Green Building Assessment. As a LEED Accredited Professional, PES can evaluate which credits the design has met and issue a LEED Assessment Report as to what level the design has achieved. Since the release of LEED® 2.0 in March 2000, project teams from more than 300 projects have registered their buildings, expressing their intent to apply for official LEED Certification by the USGBC. Increasingly, companies are turning to LEED as the blueprint by which a true “green building” can be designed. LEED is a registered trademark of USGBC. Only buildings certified by USGBC under the LEED Green Building Rating System may refer to themselves as LEED buildings. 1. PES helps in registering the project to initiate a relationship with USGBC and receive orientation materials. Registration during pre-design phase is highly recommended. 2. PES Technical support comes in the form of clarifications about the application of a LEED prerequisite or credit to the specifics of their project. As a LEED Accredited Professional, PES can evaluate which credits the design has met and issue a LEED Assessment Report as to what level the design has achieved. 3. PES helps in applying for certification. Application review can take anywhere from six weeks to several months. As a LEED Accredited Professional PES assists in response and appeal throughout the review stages (administrative, preliminary technical and final technical reviews). 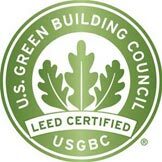 LEED (Leadership in Energy and Environmental Design) is a rating system developed by the U.S. Green Building Council (USGBC) (www.usgbc.org) to assess the environmental sustainability of building designs. LEED is a point-based rating system; points are earned for building attributes considered environmentally beneficial. LEED differs from other rating systems in that it has quantified most of the "green credits " For example, 5% of the building materials must be from salvaged materials to earn a point for the salvaged materials credit. LEED Version 2.1 consists of 69 points covering six topic areas. Each topic area has a statement of associated goals. • Site Development: Minimize storm water run-off, encourage car pooling and bicycling, increase urban density and increase green space. • Water Efficiency: Eliminate site irrigation, reduce water consumption, minimize or treat wastewater. • Energy Efficiency: Reduce building energy consumption, use renewable energy, eliminate ozone-depleting chemicals, commission building systems. • Material Selection: Minimize construction waste, re-use existing building façade, use recycled and salvaged materials, use renewable construction materials. • Indoor Environmental Quality: Incorporate daylighting, use low-gassing materials, provide operable windows and occupant control of work space, improve delivery of ventilation air. • Process: Use a LEED Accredited Professional, greatly exceed the requirements of a credit, incorporate innovative environmental features not covered in other areas. LEED is the most recognized green building rating system in North America. Although there are fewer than 50 LEED buildings that have been certified by the USGBC, there are hundreds of buildings that are going through the process. Many developers, particularly those working on federal government and leading-edge private sector buildings, are requiring that building designs meet LEED Silver performance. Given that conventional new buildings would likely score only a few LEED points, achievement of any LEED level represents a significant reduction in building environmental impact and improvement in indoor environment. The LEED system can be used in three ways to improve the "green-ness" of a building design. (1) LEED can serve as a design guide for the design team. The LEED credit system is a systematic way of ensuring that the most important environmental issues are considered during the design of the building. (2) LEED reports are a valuable means of showing the client and other interested parties that the design has effectively addressed environmental issues. (3) A building design can be certified by the U.S. Green Building Council. Certification provides increased market exposure and places the building in elite company among the most green buildings in North America. The USGBC requires registration and certification costs of 3 cents (5 cents CDN) per square foot. In addition, the USGBC requires calculations and documentation to validate each LEED credit claimed. The table below summarizes the typical costs and payback periods for LEED buildings. The payback period includes only annual utility energy savings. The larger benefit of LEED buildings is in improved indoor environment (lower absenteeism, greater productivity, better thermal comfort), lower maintenance costs (commissioned building, more durable materials, smaller or eliminated building systems), higher corporate profile (increased product sales, marketing advantage, improved employee morale) and reduced risk of remedial measures (to deal with sick building syndrome or environmental contaminants). To achieve the energy efficiency goal, analyzing and understanding the complex behavior of building energy use is very important. Princeton Engineering Services, PC specializes in building simulation and modeling to provide accurate and detailed appraisal of building energy use. The simulation process begins by developing a "model" of the building based on building plans and specifications. A base line building model that assumes a minimum level of efficiency (e.g., minimally compliant with ASHRAE 90.1) is then developed to provide the base from which energy savings are estimated. Alternative analyses are made by making changes to the model that correspond to efficiency measures that could be implemented in the building. These alternative analysis are made by making changes to the model that correspond to efficiency measures that could be implemented in the building. These alternative analyses result in annual utility consumption and cost savings for the efficiency measure that can then be used to determine simple payback, life-cycle cost, etc. for the measure and, ultimately, to determine the best combination of alternatives. Buildings account for one-sixth of the world's fresh water withdrawals, one-quarter of its wood harvest, and two-fifths of its material and energy flows. Building "green" is an opportunity to use our resources efficiently while creating healthier buildings that improve human health, build a better environment, and provide cost savings. Princeton Engineering Services, PC staff consists of LEED Accredited Professionals specializing in the design of High Performance School Buildings. • Provide a healthy and comfortable indoor environment. • Conserve energy, resources, and water. • Function as a teaching tool. • Serve as a community resource for neighborhood meetings and functions. • Ensure easy maintenance and operation. • Create a safe and a secure educational atmosphere. These and other cost-savings can only be fully realized when they are incorporated at the project's conceptual design phase with the assistance of an integrated team of professionals. The integrated systems approach ensures that the building is designed as one system rather than a collection of stand-alone systems. Even with a tight budget, many green building measures can be incorporated with minimal or zero increased up-front costs and they can yield enormous savings. • Start by selecting a site well suited to take advantage of mass transit. • Protect and retain existing landscaping and natural features. Select plants that have low water and pesticide needs, and generate minimum plant trimmings. • Use compost and mulches. This will save water and time. • Recycled content paving materials, furnishings, and mulches help close the recycling loop. The following strategies contribute to this goal. • Passive design strategies can dramatically affect building energy performance. These measures include building shape and orientation, passive solar design, and the use of natural lighting. • Develop strategies to provide natural lighting. Studies have shown that it has a positive impact on productivity and well being. • Install high-efficiency lighting systems with advanced lighting controls. Include motion sensors tied to dimmable lighting controls. Task lighting reduces general overhead light levels. • Use a properly sized and energy-efficient heat/cooling system in conjunction with a thermally efficient building shell. Maximize light colors for roofing and wall finish materials; install high R-value wall and ceiling insulation; and use minimal glass on east and west exposures. • Minimize the electric loads from lighting, equipment, and appliances. • Consider alternative energy sources such as photovoltaics and fuel cells that are now available in new products and applications. Renewable energy sources provide a great symbol of emerging technologies for the future. • Computer modeling is an extremely useful tool in optimizing design of electrical and mechanical systems and the building shell. • Select sustainable construction materials and products by evaluating several characteristics such as reused and recycled content, zero or low off gassing of harmful air emissions, zero or low toxicity, sustainably harvested materials, high recyclability, durability, longevity, and local production. Such products promote resource conservation and efficiency. Using recycled-content products also helps develop markets for recycled materials that are being diverted from California's landfills, as mandated by the Integrated Waste Management Act. • Use dimensional planning and other material efficiency strategies. These strategies reduce the amount of building materials needed and cut construction costs. For example, design rooms on 4-foot multiples to conform to standard-sized wallboard and plywood sheets. • Reuse and recycle construction and demolition materials. For example, using inert demolition materials as a base course for a parking lot keeps materials out of landfills and costs less. • Require plans for managing materials through deconstruction, demolition, and construction. • Design with adequate space to facilitate recycling collection and to incorporate a solid waste management program that prevents waste generation. • Design for dual plumbing to use recycled water for toilet flushing or a gray water system that recovers rainwater or other nonpotable water for site irrigation. • Minimize wastewater by using ultra low-flush toilets, low-flow shower heads, and other water conserving fixtures. • Use recirculating systems for centralized hot water distribution. • Install point-of-use hot water heating systems for more distant locations. • Use a water budget approach that schedules irrigation using the California Irrigation Management Information System data for landscaping. • Meter the landscape separately from buildings. Use micro-irrigation (which excludes sprinklers and high-pressure sprayers) to supply water in nonturf areas. • Use state-of-the-art irrigation controllers and self-closing nozzles on hoses. Recent studies reveal that buildings with good overall environmental quality can reduce the rate of respiratory disease, allergy, asthma, sick building symptoms, and enhance worker performance. Choose construction materials and interior finish products with zero or low emissions to improve indoor air quality. Many building materials and cleaning/maintenance products emit toxic gases, such as volatile organic compounds (VOC) and formaldehyde. These gases can have a detrimental impact on occupants' health and productivity. • Establish a vision that embraces sustainable principles and an integrated design approach. • Develop a clear statement of the project's vision, goals, design criteria, and priorities. • Develop a project budget that covers green building measures. Allocate contingencies for additional research and analysis of specific options. Seek sponsorship or grant opportunities. • Seek advice of a design professional with green building experience. • Select a design and construction team that is committed to the project vision. Modify the RFQ/RFP selection process to ensure the contractors have appropriate qualifications to identify, select, and implement an integrated system of green building measures. • Develop a project schedule that allows for systems testing and commissioning. • Develop contract plans and specifications to ensure that the building design is at a suitable level of building performance. • Create effective incentives and oversight.